There is a new ‘hawaiian sandals’ hoax spreading on Facebook. The hoax claims that everything from China is infected with toxic waste. They show a picture of ‘Hawaiian Sandals’ and a person which seems to be injured after wearing the ‘toxic Hawaiian Sandals’. Health professionals are recommending: very careful about everthing that is ‘made in china’, mainly products that have yellow, red and orange colours. This includes toys, soaps, gels, deodorants, clothing etc. 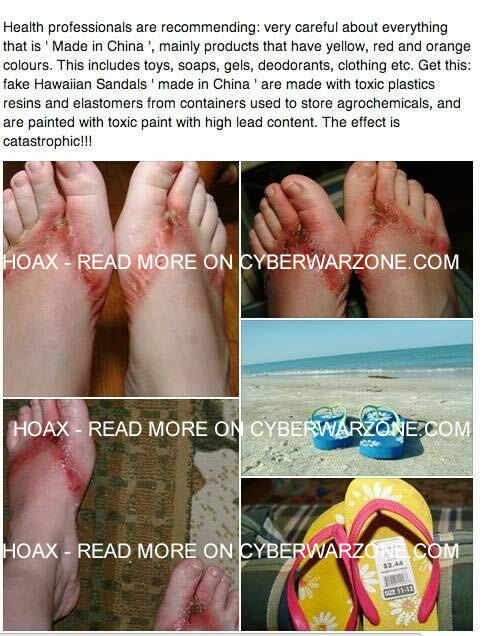 Get this: fake Hawaiian Sandals ‘made in China‘ are made with toxic plastics resins and elastomers from containers used to store agrochemicals and are painted with toxic paint with high lead content. The effect is catastrophic. The post claims that the Chinese developers are using the colours mentioned above to spread ‘toxic’ flip flops. Be aware that the mentioned colours can be changed within seconds in the factory. If you see that something is wrong with the product, then do not use it any further. The picture above shows how a single person was unable to detect the massive injuries. You can find Sandals in various types. Why not take a look for a Sandal which does not bind your toes. Take someone with you, when you go shopping for Sandals. Each product which is imported or exported is tested by various companies. These companies take a look at the values which are present in the products. This could be toxic contents, bad quality content and so on. The barcodes on the products show where they are created and when they are created. If you still believe it is real. Call the company of the brand and ask them for more information. Do not trust a Facebook message which is simply claiming stuff. In June 2007, Kerry Stiles of Ocklawaha, Florida, purchased a pair of “Sand-N-Sun” flip flops at Wal-Mart. Soon after wearing the sandals, she developed a painful skin rash or chemical burn on her feet that corresponded with the thong portion of her flip-flops. This is just another hoax which is being used to bring ‘likes and shares’ to the Facebook page which is sharing this message.